Help your customers easily find the way to your establishment with eye-catching custom Floor Decals. Floor Decals or floor graphics are used for product and brand promotion. Floor Decals can be used both outdoors and indoors – on any smooth, dust free locations. Decals, stick on the surface and stay for up to 2 years. These are quite affordable means of advertising that are perfect both for seasonal and permanent promotions. In short, these Decals are the advertising tool that you just can’t miss – and – for reasons you wouldn’t ever expect! You see, a study by Cision revealed that 60% of adult population in America, use their smartphones during walking. Which, of course means they spend a lot of time looking down (4.7 hours a day on average to be exact.) In terms, of getting more business this means the likelihood of catching your prospect’s attention with a floor decal is just massive – as compared to other means of outdoor advertising! The most common usages are sale announcements in malls, directional signs in big areas, wedding hall decorations, exit signs etc. Store owners use floor decals to announce their promotions or special offers even very far from their stores leading people there with attractive visuals and offers. For businesses located far from busy roads floor decals are a must. They will inform potential customers about your existence and lead them to your business. 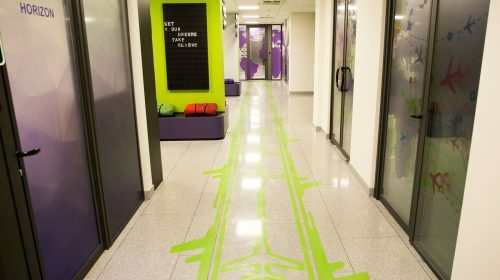 Besides the promotional role, Floor Decals can very well be used for decorative purposes as well. Weddings, birthdays and other celebrations are great for decorating the venue floors with Decals. You can use Floor Decals for any purpose, the only limit is your imagination. For printing on our VInyl Floor Decals, we use premium UV inks. The printer dries the inks with ultraviolet rays right after the printing process. This makes the inks sun resistant and guarantees a long lifespan. 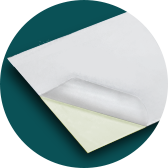 Another thing, that ensures long-term use of your decal is the lamination finish. This extra layer of protection makes the decal fade, tear and abrasion-resistant. The wide spectrum of colors we provide allows to print any graphics on your floor decals in the exact colors you desire (no matter how uncommon those colors may be.) You can use your own design or use Our Design Service. Floor Decals can be applied to all types of smooth-surfaced floors. There are two types of Decal installations, dry and wet. Before the installation make sure the surface is clean, otherwise the dust particles will form bubbles under the Decal. Position the Decal and take the back paper off. Apply the Decal by smoothening it with a squeegee. After the installation flatten it with your hand to ensure everything is attached. In case of wet installation, spray the surface and the sticky side of the Decal with a soapy water, which allows the Decal to be repositioned if needed. Follow the same steps as in case of dry installation and you are done. You can also use our installation service, in case of which our professional craftsmen will install the Decals for you. If needed, we offer specialist team to install or replace the large graphics in a time-saving manner and with proved professionalism. Our craftsman have huge experience behind their back to handle any large-scale projects for you. Window decals - With the help of window signage, showcase your product or service promotions with the help of window stickers. Moreover, Window Vinyl Decals are used to inform the opening and closing hours of the commercial establishment, decorate - and thus transform into a delicate marketing tool - the storefront to attract more prospects. Floor decals are very versatile. You can use them both for decorations and advertising. If you need to raise some interest in your building 3D floor graphics are an amazing tool of it. You can also decorate the floors of your wedding hall, celebration area or the entrance of any building with a welcoming message. 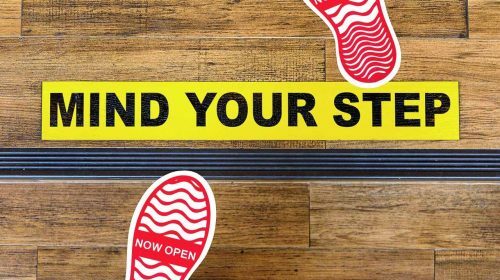 For promotions, you can have “sale” messages printed on floor decals and install it in front of your store or in the street - for directing people to you. This will work fine also with some informational message telling people that you are in the place where the floor decal shows to them.